LONGSTEPS REFURBISHED & UPGRADED 2017 Voted one of the top three 'best places to live' in Britain by Country Life magazine. Fowey is a bustling sailing port on the Fowey Estuary, set in stunning countryside, with dramatic beaches nearby. Known for its sailing, walks, stunning views, and vibrant streets, Fowey is a gem in Cornwall and inspiration to many of Daphne Du Maurier's books. It is also home to the annual Du Maurier literary festival and the Royal Sailing Regatta. Fowey has an eclectic mix of independent shops and colourful restaurants, pubs etc. Apart from the sailing Fowey has access to some of Cornwalls fantastic beaches, kayaking, stunning walks and within easy reach of Eden project. Please note that our cottages are non-smoking cottages. Littlesteps our one bedroom cottage can be rented out together to accommodate the larger party. You can load and unload just past the front door in a pull in, then park in the main car park which is about a 5 - 10 minute walk away. Golfers may wish to use the extensive facilities at the Lostwithiel Golf and Country Club or alternatively at Carlyon bay, Lanhydrock National trust. We had a lovely weekend. The cottage was extremely well presented, very clean and beautifully decorated! 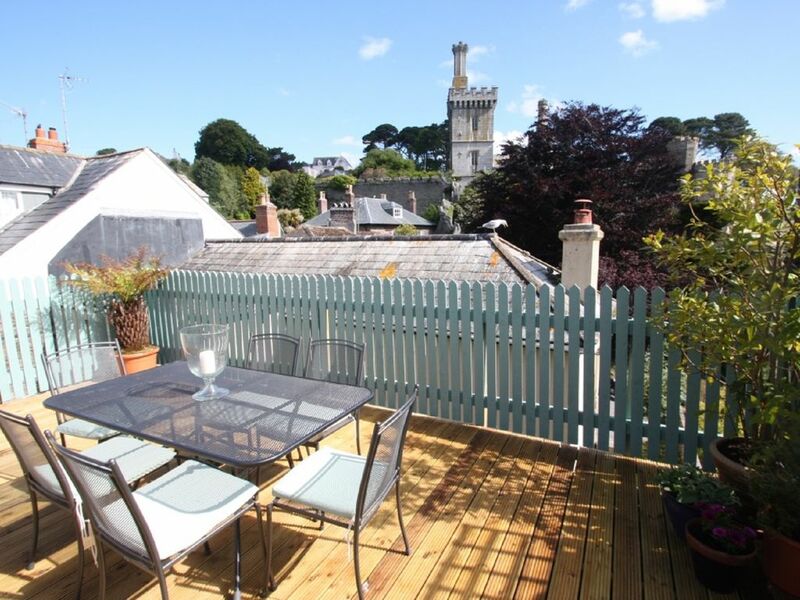 Fowey has a unique and ancient charm which holds a special fascination for visitors of all ages. Fowey is renowned for sailing in the estuary and attracts both experienced and novice sailors alike. Fowey Regatta week is the highlight of the social calendar, with Sailing, The Red Arrow Display Team, Carnival, Fireworks display and lots of live bands being but a few of the events taking place. Private boat hire, sailing, canoeing and diving lessons are all available from Fowey. Lots of lovely walks around the superb National Trust land and beautiful coastlines and beaches that surround Fowey. We have two bathing beaches in Fowey, Readymoney Cove, a small sandy beach 15 min stroll from the town centre and Whitehouse Beach which is on the Esplanade, and only a 5 min walk from the town centre. Polkerris Beach is 15 mins drive away and has two nice restaurants. Buses run regularly from Fowey into Par and St Austell and to the nearest train station, Par, which is only 5 miles from Fowey. There is a seasonal local Fowey Town Bus that runs throughout the day. The Polruan ferry runs from early morning, throughout theday and into the evening. The Bodinnick car and passenger ferry also runs continuously throught the day and evening and makes a quicker journey to Lerryn, Pont and Mixtow and all points east! Eden Project - really worth seeing - 15 mins drive. Padstow - Rick Steins restaurants are only 40 mins away. The Lost Gardens of Heligan are 15 miles away. Lanhydrock House (National Trust) is only 7 miles away. Pinky Murphy's - try the Pinky's Plater. Brown Sugar - coffee and cakes - fab pancakes. The Ship Inn - traditional pub with a real fire. Sams - brilliant burgers and seafood. Nathan Outlaw at the Marina Hotel - for Michelin stars. We have some fantastic local shops including Fowey Fish, which sells locally caught fresh fish and has an extensive selection of wines. Nile's bakery sells fresh bread and cakes. In addition we have a super local butcher, deli and green grocer - you really don't need your car!